As your little girl starts perfecting her walking skills, keep her feet comfortable and supported with our ergonomical baby shoes collection. The Lady collection from Attipas ensures your baby gets the very best support for their development with no compromise on style. The classic lace detailing at the edge of the sock makes them suitable for special occasions or everyday wear. 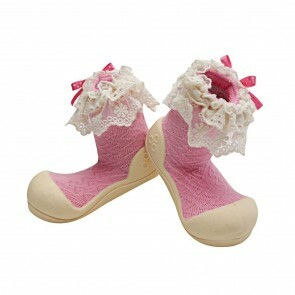 Designed with infants in mind, these smart and stylish shoes for little girls come in a nice pink colour.